His Holiness Drikung Kyabgon Chetsang, the 37th throne holder of the Drikung Kagyu Lineage and 7th reincarnation of the Chetsang Rinpoche is a manifestation of Chenrezig (Avalokiteshvara). His Holiness Drikung Kyabgon Chetsang, Konchog Tenzin Kunsang Thrinle Lhundrup, was born on the 4th day of the 6th Tibetan month of the Fire-Dog-Year 1946 into the aristocratic family of Tsarong in Lhasa. This auspicious day marks the anniversary of the Buddha’s first turning of the Wheel of Dharma. Many prodigious signs and visions accompanied his birth. His grandfather, Dasang Damdul Tsarong (1888-1959), has been the favorite of the 13th Dalai Lama (1876-1933), Commander General of the Tibetan army and one of the most influential political figures in the early 20th century in Tibet. Chetsangs father, Dundul Namgyal Tsarong (b. 1920), held a high office in the Tibetan Government and he was still active in important positions for the Exile Government in Dharamsala after the escape of the Dalai Lama and the cabinet ministers. His mother, Yangchen Dolkar, is from the noble house of Ragashar, which descended from the ancient royal dynasty. Few years after the passing of the previous Drikung Kyabgon, Shiwe Lodro (1886-1943), two parties began to look for his reincarnation throughout Tibet. Based on a vision of the Drikung regent Tritsab Gyabra Rinpoche (1924-1979) at the oracular lake Lhamo Latso and on many additional divinatory signs, in 1950 the son of the Tsarong family was recognized as the reincarnation of the Hi Holiness Drikung Kyabgon Chetsang. The boy subsequently passed numerous tests, such as identifying religious items and ritual objects of his former incarnations. His incarnation was further confirmed by divinations performed by Taktra Rinpoche (the Regent of Tibet), H.H. the 16th Karmapa Rangjung Rigpe Dorje, and H.H. Taklung Matrul. In the fall of 1950 the formal enthronement as Drikung Kyabgon Chetsang took place at Drikung Thil, the main monastery of the Drikung Kagyu order. Immediately thereafter the first Chinese invasion of Tibet took place. Rinpoche was allowed to travel to Kalimpong in Northern India with his family, in order to stay in a safe place. His older brother and his two sisters were attending boarding-schools in Darjeeling. After some months Rinpoche was met by a delegation from the Drikung monastery and brought back to Tibet. According to ancient tradition, the Drikung Kyabgon Chetsang resided in turns in one of the four main monasteries: In the spring in Drikung Tse, during the summer in Yangrigar, in autumn in Drikung Thil, and during the winter in Drikung Dzong, which also served as the administrative center of Drikung. His spiritual instructors (yongzin), Tritsab Gyabra Rinpoche and Ayang Thubten Rinpoche (1899-1966), were responsible for his education. His curriculum included reading, writing, memorizing, astrology, and grammar. From his yongzin and from Bhalok Thupten Chodrak Rinpoche, Lho Bongtrul Rinpoche, and Nyidzong Tripa he received the basic empowerments, transmissions, and teachings of the Kagyu tradition and the Drikung Kagyu tradition in particular. At the age of eleven, Drikung Kyabgon Chetsang gave his first public teaching and transmission, a long-life empowerment, during the 1956 Monkey Year ceremonies of the Great Drikung Phowa. Subsequently he began his philosophical studies at the Nyima Changra monastic college of Drikung. Although he was four years younger he studied together with the second Drikung lineage holder, the Drikung Kyabgon Chungtsang. His instructor was Bopa Tulku Dongag Tenpa (1907-1959), introducing him to the philosophy of Madhyamaka. He first studied basic texts, like The 37 Practices of a Bodhisattva by Ngulchu Thogme Zangpo and Introduction to the Bodhisattva's Way of Life (Bodhicharyavatra) by Shantideva. Soon thereafter Tibet underwent a great upheaval. In the wake of the Tibetan uprising of 1959, as many Tibetans fled the country, among them the Dalai Lama, the cabinet ministers and a host of spiritual dignitaries, several attempts were launched to bring the Drikung Kaybgon Chetsang and the Drikung Kyabgon Chungtsang out of Tibet into safety. These attempts failed because of the inexorable resistance of the monastery manager. His Holiness Drikung Kaybgon Chetsang's family had already fled to India in 1956. The monks in the Drikung monastery were put under house arrest, and the Drikung Kaybgon Chetsang had to endure with them for months Communist indoctrinations. After some month Tritsab Gyabra, who had left the monastery some years before, took the Drikung Kaybgon Chetsang to live with him in Lhasa under rather dismal conditions. In 1960, Drikung Kyabgon Chetsang was admitted into an elementary school in Lhasa. In very short time he mastered the subject matters of several classes, being able to finish the six years of education in only three years. Thereafter he was admitted to the Jerag Lingka middle school. The subjects there included Chinese, natural sciences, history, and biology. The Drikung Kyabgon Chetsan excelled in his studies, especially in Chinese. He also became a keen athlete and a passionate and brilliant soccer player. When the Red Guards infiltrated the schools at the onset of the Cultural Revolution in 1966, the Drikung Kaybgon Chetsang found himself caught up in the midst of the factional fighting of two opposing groups of Red Guards. Classes and business came to a halt. Many aristocrats and Rinpoches had to undergo brutal “people’s tribunals” known as struggle sessions. 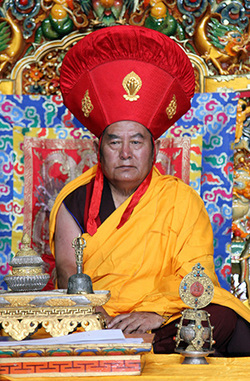 The Drikung Kyabgon Chetsang could no longer stay with Tritsab Gyabra, who had fallen from grace. He lived at the school, where he cooked for the few remaining schoolmates and studied the books he found in the school’s library. Lhasa sank into chaos. In this atmosphere of anarchy the Drikung Kyabgon Chetsang several times was saved by a fraction from certain death. In 1969, he was assigned to a commune in the countryside, where he had to carry out the hardest physical labor. A partly decayed verminous shack on top of a sheep pen was his shelter. He did not own more than a pot and a cup and some slats to sleep on. An uncle, who came to visit him one day, struggled against his tears, stunned that his nephew was living in such squalor. But the Krikung Kyabgon Chetsang always reacted with great equanimity to all the many upheavals in his live. When the uncle became aware of the serene calmness pervading every aspect of the Drikung Kyabgon Chetsang’s being, he compared him with Milarepa, who lived in comfortless caves and outwardly austere, but inwardly excessively rich spiritual life. In the spring and in summer the Drikung Kyabgon Chetsang drudged on the fields of the work unit. In autumn he had to climb high mountains to cut firewood for the commune and carry home heavy loads. In the winter he had to shovel out the sewage from the cesspits in Lhasa and carry it to the farm. Despite the strenuous labor, the Drikung Kyabgon Chetsang helped others, whenever he could. Nobody knew that he was the the Drikung Kyabgon Chetsang, but his extraordinary deeds amazed many. Due to his class background as aristocrat and high incarnate lama there was no prospect for the Drikung Kyabgon Chetsang in Communist occupied Tibet. After meticulous planning, he finally found a means of escape in 1975. This was at a time when China had established a tight system of spies and informers all over Tibet and the military had a close grip of control, so that only few succeeded to take flight. He set out alone and without help to cross the border of Tibet into Nepal across high passes and glaciers. The Drikung Kyabgon Chetsang accomplished what was thought to be impossible. Unscathed he reached Nepal and eventually the residence of the Dalai Lama at Dharamsala. His Holiness the Drikung Kyabgon Chetsang conceded to the appeals of the Drikung lamas in exile and so he was again symbolically enthroned as the the Drikung Kyabgon Chetsang during a ceremony with the Dalai Lama. By this act he expressed the promise to take responsibility for the lineage in the future. Initially though, he traveled to the USA, where his parents had in the meantime emigrated to. There he learned English, while earning his living as a part-time at a McDonald's and other restaurants. For many years in occupied Tibet and in the USA, the Drikung Kyabgon Chetsang had outwardly led the life of a layman. Nonetheless he had always strictly kept his monk’s vows. Now he resumed his monastic lifestyle once again and took up residence at Phyang Monastery in Ladakh. Instantly he entered a traditional three year retreat at Lamayuru Monastery under the guidance of the stern meditation master Kyunga Sodpa Gyatso (1911-1980). The Drikung Kyabgon Chetsang studied with numerous highly accomplished lamas and Rinpoches of different traditions and received from them teachings and initiations. He regards Dilgo Khyentse Rinpoche (1910-1991) as one of his most important teachers. He received from him the essential teachings of the Eight Practice Lineages of Tibetan Buddhism (Dam Ngag Dzo), the highest Dzogchen teachings (Nyingtig Yashi), as well as the collected writings of Jamgon Kongtrul (Gyachen Kadzo) and the treasury of the oral Kagyu transmissions (Kagyu Ngag Dzo). In addition he received precious teachings and empowerments from H.H. the Dalai Lama (Chakrasamvara, Kalachakra, and Yamantaka), from H.H. the 16th Karmapa (Six Yogas of N?ropa and Milarepa), from H.H. Taklung Shabdrung Rinpoche (transmission of the Taklung Kagyu teachings) and from H.H. Taklung Tsetrul the Northern Treasures. He studied Buddhist philosophy under Khenpo Noryang in the Drukpa Kagyu monastery Sangnag Choling in Bhutan, who gave him teachings on the Bodhicharyavatara by Shantideva, the Madhyamakavatara by Chandrakarti and on the Uttara Tantra. Khenpo Noryang also transmitted to him teachings of the general Kagyu tradition and the particular teachings of the Drukpa Kagyu on Mahamudra. Moreover Chetsang Rinpoche received important Drikung Kagyu empowerments and teachings on Maa?mudr? from H.E. Garchen Rinpoche and Drubwang Konchog Norbu. In 1985, the Drikung Kyabgon Chetsang received full monk's ordination from His Holiness the Dalai Lama, during the Kalachakra initiation in Bodhgaya. He mastered all challenges with remarkable ease. Since 1987 the Drikung Kyabgon Chetsang began to give teachings in many countries throughout the world. At the same time he started to rebuild the weakened Drikung Lineage with great energy. In Dehra Dun, India, he established a monastery and an educational center, attracting many monks from Tibet and Buddhist practitioners from many countries: the Drikung Kagyu Institute. In the beginning it consisted of the monastery Jangchubling and the retreat center and nunnery Samtenling. The Drikung Kagyu Institute is an education center, which emphasizes both the traditional monastic education, as well as present-day training to meet the needs of these times. Special consideration is also placed on discipline, meditation practice and the specialties of the Drikung Kagyu teachings. In 2003 the Drikung Kyabgon Chetsang established near his monastery a magnificent edifice: the Songtsen Library, a center for Tibetan and Himalayan studies. A building epitomizing in content, function and form the essence of his vision as a treasury and think tank for the cultural and spiritual identity of the peoples of the Himalayan region and of the Drikung Lineage in particular. It contains rare texts about all subjects of the Himalayan region, works on Tibetan culture, tradition and geography, and of course the Buddhist texts of all schools. It houses an important collection about the famous Dunhuang manuscripts unearthed along the Silk Road. There, an unimaginable wealth of texts in various languages dating from the 4th to the 11th centuries was discovered. The Tibetan corpus alone includes thousands of manuscripts of all kinds, including the earliest Tibetan medical drawing known at present. Thus these ancient texts provide the researcher with a vast array of source material on the earliest period of Tibet, which the Krikung Kyabgon Chetsang would like to make accessible in its entirety, as his scope encompasses the preservation of Tibetan culture and religion. In 2005 close to the Songtsen Library, Drikung Kyabgon built a large College for Higher Buddhist Studies, the Kagyu College. With its inauguration the new Drikung Mandala in Dehra Dun has been completed. His Holiness Drikung Kyabgon Chungtsang, the 36th throne holder of the Drikung Kagyu Lineage and the 8th reincarnation of the Chungtsang Rinpoche is a manifestation of Manjushri. Drikung Kyabgon Chungtsang, Tenzin Chokyi Nangwa, was born in the Water-Horse-Year 1942 in Lhokha as the youngest of five sons into the prominent aristocratic Lhagyari family. His father was Trichen Kelsang Nyendrak and his mother Rigzin Chodzom. The Lhagyari family is one of the oldest noble houses of Tibet descending from the ancient royal dynasty. The family branch is called Dewa Lhagyari Trichen. After the untimely passing of the 7th Chungtsang Rinpoche, Tenzin Chökyi Jungne (1909-1940), the youngest son of the Lhagyari family was recognized as the reincarnation of the Chungtsang Rinpoche in 1946 and was enthroned in Drikung Thil Monastery. There were many signs, divinations and consultations of oracles that confirmed his reincarnation. Gyabra Tritsab had a vision at Lake Lhamo Latso which was substantiated by further divinations by H.H. the 16th Karmapa and by H.H. Taklung Matrul. The Tibetan Government authenticated the reincarnation as well, and Chungtsang passed the traditional test of selecting religious items belonging to former reincarnations. At the age of eight years he started to learn to read and write, memorize texts, and to perform rites and rituals. 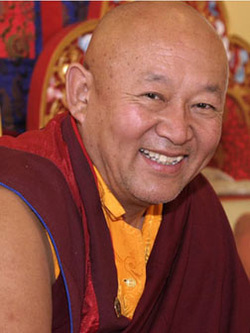 His main spiritual instructor (yongzin) was first Gar Khensur Tsangyang Norbu Rinpoche, from 1955 onwards Tritsab Gyabra Rinpoche and Ayang Thubten Rinpoche. He received transmissions, empowerments, and teachings of the Kagyu tradition and the Drikung Kagyu tradition in particular by Tritsab Gyabra, Ayang Thubten, Lho Bongtrul Rinpoche, and other eminent Lamas. In 1959 after the Tibetan Uprising, the Drikung Kyabgon Chungtsang had to undergo Communist indoctrinations and severe struggle sessions at Nyima Changra Shedra, where the Chinese Army had established their regional headquarters. He was badly mistreated and in December 1959 he was put in jail. The Drikung Kyabgon Chungtsang remained imprisoned for 23 years until 1982. Especially during the times of the Cultural Revolution he had to undergo harsh re-education programs and to perform forced labor. At that time he was transferred to the infamous prison camp at Kongpo Ningtri. There he had to cut down trees in the woods. One day he was hit by a falling tree and badly injured. It was said that he only survived because he was the Drikung Kyabgon Chungtsang. Eventually he was released from prison in the course of the political liberalization of 1983 in China and was given a post in the Regional People’s Congress and subsequently a leading position in the Department of Religious Affairs of the Tibet Autonomous Region. In 1985 for the first time the Drikung Kyabgon Chungtsang was allowed to travel to India to meet his brothers who had left the country. He also came to visit the Drikung monasteries in Ladakh and there he met the Drikung Kyabgon Chetsang again after 26 years. The second time he was allowed to travel abroad was in 1992. The Krikung Kyabgon Chungtsang came for the inauguration of Drikung Kagyu Institute’s Jangchubling Monastery to Dehra Dun. As it was a Monkey Year, he gave the traditional Monkey Year Teachings together with the Drikung Kyabgon Chetsang. For the Drikungpa the sun and the moon had finally conjoined again. At that time the Drikung Kyabgon Chungtsang was promoted to deputy secretary general of the Office of Religious Affairs in Lhasa, a post that he still holds today.